A fun, cheap, scenic alternative to more mainstream road trips – tour western New York state’s Jello Museum, farms, minor league games, theme parks and so much more. This summer, when travelers are staying closer to home and spending less on leisure activities, we’ve discovered that the regions surrounding the really famous tourist attractions are usually a better value. The Greater Niagara region’s Routes 5 and 20 run east to west across New York State; these two historic routes will take you anywhere you want to go, from the JELLO-Museum in LeRoy, New York to the Finger Lakes and on to Niagara Falls. So pack up the kids for a summer roadtrip to western New York. Here is a list of great places to visit along these routes that offer cheap, and often times free, family fun for everyone in the surrounding areas of Niagara Falls. We suggest starting your journey in Wyoming County, then heading north to Genesee and Orleans Counties before you make the final leg of your trip west to Niagara Falls. You should give yourself at least five days to cover the entire area, but if you’re just looking for a quick day trip or overnight then 2-3 days should give you plenty of time to explore Niagara Falls and make a few stops along the way at one of our featured attractions, as they are all within about an hour of Niagara Falls. Come to Wyoming County, where there are more cows than people. What is there to see other than cows? First there’s the Gates House, where visitors can learn about the major role the town of Warsaw played in the Underground Railroad movement. Then there’s Gaslight Village, a quaint village that is still lit by the original gas lights and has over 70 homes listed on the National Register of Historic Places. There’s also Attica State Prison, which is surrounded by a farm the prisoners used to work on as farm hands. Just 62 miles southeast of Niagara Falls, Wyoming County is a great place to start your adventure to one of the most beautiful natural landmarks in the world. Begin your trip in Castile, New York at Letchworth State Park, a 17-mile-long park, where the deep ravines and bountiful waterfalls throughout the park will captivate the whole family. Often times called the Grand Canyon of the East, the park is complete with accommodations including cabins and the Glen Iris Inn, where you can dine on fine cuisine, and they have rooms available for guests to stay in as well. There are 270 electric sites and 50 camp sites, with prices ranging from $21/N-$27/N. If you plan on bringing pets, call ahead to check which sites are pet-friendly, since pets are allowed only at specific sites. Be careful if you’re driving through the park as deer run rampant. There’s also Pinewood Lodge and Caroline’s Cottage for those who aren’t that into the natural surroundings of camping. While visiting the park take part in some of the activities offered, ranging from rafting and hiking to biking and guided nature walks. There is no swimming allowed in the Genesee River, but there is one pool at the North end of the park, which has a small usage fee. Also check out the hot air balloon ride options the park offers, an exciting activity for all. The Hidden Valley Animal Adventures park is an exciting outing with many animals including cows, llamas, ostriches, goats, and bison. The park is set on a gorgeous piece of land, with a duck pond, and a lodge which will feature a sit down restaurant and a snack bar. Guests are driven through the park aboard old Army jeeps to see the animals and take pictures making this a real adventure. Little kids will love the thrill of being so close to the animals, and being able to feed the animals. In Genesee County you will only be 45 minutes away by car from Niagara Falls. Off exits 47, 48, and 48A you can stop in Genesee County and visit historic landmarks, theme parks, catch a baseball game, or even play a round of golf at one of the many championship courses in the area, a favorite jaunt for Canadians. Before heading to the falls, explore Genesee County and learn about the Native American heritage of the area, and enjoy the central location to many great areas in the Niagara Region. As the birthplace of JELLO, Genesee County along Route 5 honors their famous gelatinous friend with a museum outlining the history and colorful past of everyone’s favorite snack. Enjoy a stroll down the JELLO-brick road, as you wander through old advertisements and enjoy the trivia games testing your JELLO knowledge. Kids will love the play corner, where they can color and make special treats in the Fisher Price kitchen. Take a seat and watch all of the commercials that made JELLO what it is today, and relive Bill Cosby’s rise to JELLO King. The tour guides are very enthusiastic, which makes the experience all the more fun. Open daily, small admission fee. After touring the JELLO Museum head outside and walk to the LeRoy House, situated right in front of the museum. The LeRoy House is a wonderful homage to the hometown family, and captures the town nicely through restored paintings, and other artificacts. The house is maintained by the LeRoy Historical Society, and they offer tours year round, including many activities for school groups. Admission is free, but donations are welcome. Head east to Batavia where you’ll find Dwyer Stadium home of the St. Louis Cardinal’s farm team, the Batavia Muckdogs who earned top honors in the NY Penn League, winning the championship in 2008. With affordable prices for the whole family (the most expensive ticket price is $7), they offer family four-packs, (includes 4 tickets, 4 hot dogs, and 4 soft drinks) and other fun activities throughout the season including fireworks and low-priced food to accommodate families. This landmark museum offers free tours daily, displaying artifacts from the Seneca Indians, military pieces, and other cultural wonders. Included in the museum is a special exhibit honoring the life of hometown hero, former Congressman and President of the World Bank, Barber Conabel. Conabel was a well respected and highly connected government official, which is evidenced through photos of him with former presidents Richard Nixon and Bill Clinton. He was an old-school politician who truly cared about community service, and all visitors will get a laugh out of the framed checks he received from numerous colleagues, including President George H.W. Bush, which he never cashed. Another fun exhibit is the 25 Things That Made Genesee County Famous, which include JELLO and the Byron Dig. Closed Sunday and Monday. Just a short walk from here is Jackson Square, a great place to be during the summertime. Every summer Friday night, there are free concerts and visitors can enjoy the gorgeous murals painted by local artists. Only 30 miles east of Niagara Falls is Orleans County, at exit 48 and 48A off the NY State Thru Way. Here you can drive under the Erie Canal Culvert between Routes 31 and 104, which cover the entire county, or even walk alongside the famous canal. The Culvert was built in order to avoid the expensive and long construction of a bridge, and is featured in Ripley’s Believe It or Not! Orleans also gives visitors a treat, as they are home to the only cobblestone museum in the world. Visitors can drive along Routes 98 and 104 to get a glimpse of the gorgeous buildings and churches made of cobblestone. Inspired by similar trails in other states, local farmer Lora Partyka established the Country Barn Quilt Trail in Orleans County in 2006. Visitors have a truly unique opportunity to tour the rustic back roads of Western New York and learn the history behind the quilts at each stop. The trail begins in Kendall, New York at Partyka Farms, where you can see the first of over 40 barns and other buildings adorned with handpainted quilts, which each have a story that visitors can listen to by using their mobile device to call the number specified at each location. At Partyka Farms you can pick up free maps and start your journey down the trail. While on your driving tour stop at some of the local farm stands, orchards, and historic barns and try some of their delicious offerings. This is a free, self-guided tour. At the Medina Railroad Museum, the country’s largest freight depot, kids will love the model train layout. The display is 204 feet by 14 feet and has so many intricate details that you’ll have to visit more than once just to see all the minute displays, as they are constantly adding new features to the landscape. You will feel as though you’ve gone back in time when the conductors greet you in full attire, as you board the train. Train rides range in theme from a Fall Foliage excursion to Santa Train Rides and a Day Out with Thomas the Tank Engine. In October, a Phantom Express Halloween train takes visitors on a spooky-inspired adventure. Winery train rides are also available. Open daily except Monday, small admission fee. Train Excursions require separate ticket. 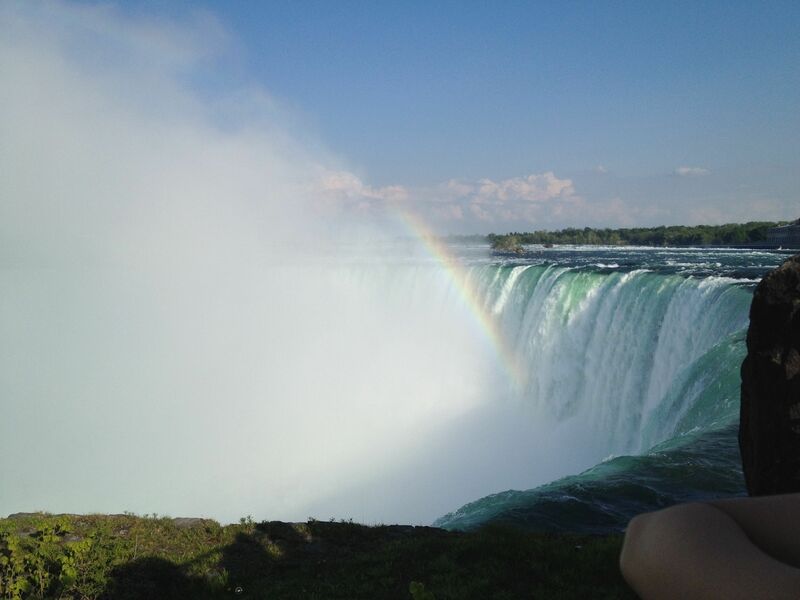 A natural wonder, Niagara Falls State Park offers guests an up-close look at one of nature’s most beautiful features. With the recent enforcement of passport restrictions when crossing the Canadian border, now is the best time to explore the American side of the falls, which offers a more peaceful, less-commercialized atmosphere. The surrounding park is perfect for family picnics and the falls offer many activities to entice visitors, such as the Maid of the Mist, a tour boat that takes you right into the falls. Open daily, kids < 12 pay reduced fee. Another fun activity is the Cave of the Winds tour, which takes guests on a 175-foot elevator ride to the Niagara Gorge. While covered in a rain poncho and sandals, you will be taken to the Hurricane Deck where you will experience hurricane-like conditions. Open daily, admission fee. On your way back from the Falls, check out the Strong Museum of Play (One Manhattan Square, Rochester, NY 14607 585/263-2700) in Rochester. With interactive exhibits at every turn, you can spend hours in this brightly-colored museum. Kids will love the Sesame Street exhibit where they can talk to Elmo on the phone, and even sit on the famous stoop. Another featured exhibit is Wegman’s Supermarket where kids can take their grocery carts and go shopping. They even have miniature cash registers, which print out receipts to make the toddler shopping official. Open daily, small admission fee. Oliver’s is a family-owned, classic candy store in Genesee County, where you can tour the kitchen and see how they make the candy. It’s a bit overwhelming walking through the store, as there are so many options you’ll have a hard time choosing what kind of candy you want. They also have an ice cream parlor located in the rear of the store, which has an outdoor patio where you can enjoy your ice cream treats during the nice weather. You can order candy online as well, so check out their website to see all the great offerings they have. Open 9am-9pm, seven days a week. Also in Genesee, Alex’s Place offers award-winning steak, ribs, and seafood and is conveniently located across from Batavia Downs Gaming & Casino, a fun place for parents, where kids will enjoy the racing from July through October. The restaurant has a very family-friendly atmosphere, offering a cozy lunch and dinner option for families looking to have a nice sit-down meal. For larger groups of five or more call ahead for a reservation. The Made In America Store (900 Maple Road in Elma, New York) is an unusual stop with lots of fans; they guarantee that the 3,500 goods on display are 100% American manufactured products. It draws lots of visitors from around the country who can suggest new products to carry, and more than 290 vendors — including the packaging manufacturer — are represented. All US military personnel receive a discount and those who drop in leave with their own tiny American flag. If you don’t have much time and you’re looking for some great food and local Greek fare, check out Settler’s Restaurant (585/343-7443; 353 W. Main Street, Batavia, NY 14020), a great diner with superb service. The M&M pancakes are amazing, and the service is fast and efficient. The Pok-A-Dot (585/343-9873; 243 Ellicott Street, Batavia, NY 14020) is another traditional diner that has great American classics on the menu and the prices are really cheap. You have to try the crunchy French toast at D&R Depot Restaurant (585/768-6270; 63 Lake Street, LeRoy, NY 14482). They dip the French toast in corn flakes to make it extra special and it is delicious. This quaint little restaurant was converted from a former train station and they have seasonal displays hanging upside down from the ceiling that are fascinating to look at. Another option, for lighter fare is the Shirt Factory Café (585/798-2633; 115 West Center Street, Medina, NY 14103) located in the old R.H. Newell Shirt Building in Orleans County. Here guests can dine on a three-course dessert, while enjoying a movie, and live music is also a constant at this little-known café. With a nostalgic décor outlining the history of the Shirt Factory and the famous clientele who frequented the business, such as Winston Churchill, this is a real treat for anyone looking to relax in a quiet place to sip a latte and read a book, or simply to enjoy the ambiance. Just off of exit 48 off the New York State Thruway you will find all of the hotels in Batavia, New York, a central base for all of these attractions. Batavia has many places to stay including the Comfort Inn, Hampton Inn, Best Western, and the Holiday Inn. The Quality Inn & Suites is a great option for families, offering amenities including free WiFi in rooms and a business center with a printer for anything you may need. A continental breakfast is available each morning, and there is a pool on-site as well. A perennial favorite with families is Yogi Bear’s Jellystone Park & Campground (800/232-4039 5204 Younger’s Road, North Java, NY 14113) in nearby Wyoming County. Along with the RV and tent park, there’s a water park, which only adds to the other great offerings the site has to offer, including an arcade, mini-golf, and pool. There is also an arts and crafts lodge where your kids can create masterpieces to hang on your refrigerator. With gas prices being so unpredictable a little secret for traveling in this region is the Tonawanda Indian Reservation beginning in Genesee County and continuing on into Erie and Niagara Counties. Aside from the shopping and the historical impact the reservation and the Senecca Indians had on the state, the reservation also has the unique ability to avoid state taxes, so gas is much cheaper, which is good to know if you’re on your way to Niagara Falls. For more information on the Greater Niagara Region visit Country Byways or visit the Genesee County, Wyoming County, and Orleans County individual tourist sites for more specific information.